A river flows by, taking with it the last days of autumn and carrying us into winter. Welcome to November's issue of Whispers, the newsletter of the Dereila Nature Inn - your cyber nature centre where we celebrate nature and photography every month with trivia, tips and site updates. Thank-you for supporting our project. We hope you'll enjoy this issue. 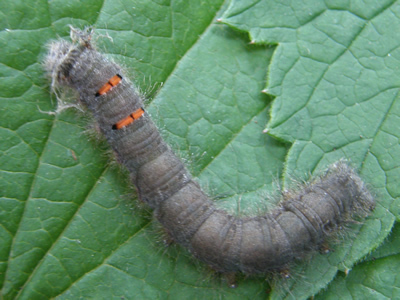 Here's this month's trivia question: What is the fastest insect? 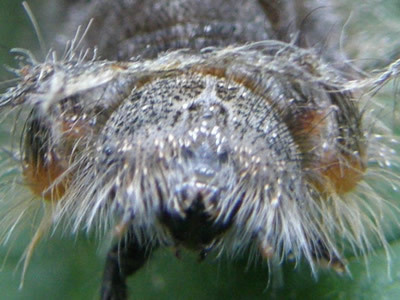 Here's another mysterious close-up image for you to solve. Can you figure out what this rather bizarre thing is? You'll find the answer below. For more of this type of mystery solving, be sure to visit our pages of Close-ups in Nature. Here are the newest additions to the Inn. Click on the images below to visit the pages. Chickadees and other wild birds will love this tasty snack. We invited you to submit images to celebrate autumn in your area. Check out the great pictures we received! 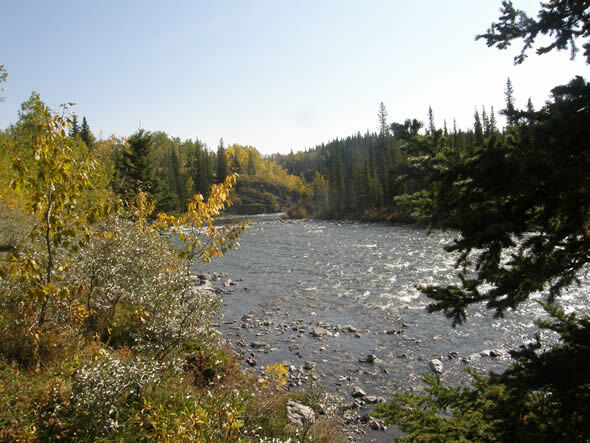 The latest destination in a series featuring special places in the natural world takes us to Canada's Yukon territory. We've added two new pages to this series: The Caribou and the Muskox. 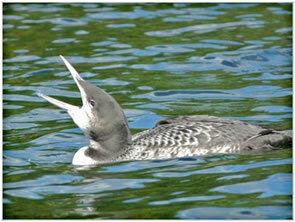 To see the latest postings at the Inn as they are added visit the news and updates page. As a community of nature enthusiasts exchanging ideas, stories, tips and images, we invite you to submit nature photographs to this part of our monthly newsletter. This month we have three people who sent us submissions. 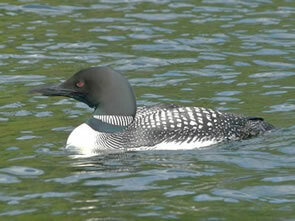 Claudia from Scotia, NY sent in these great Common Loon pictures. Rob Walker from Victoria, BC. 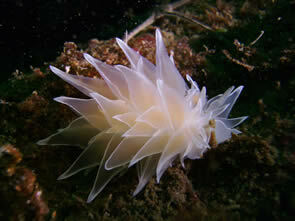 sent in two more amazing photographs from beneath the sea. 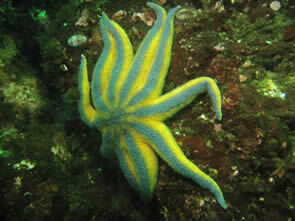 This is a Rainbow Seastar and a Frosted Nudibranch. outside of North America are these two pictures from Eileen. 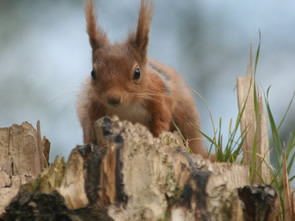 On the left is a cheeky looking Red Squirrel and on the right a Gold-ringed Dragonfly. Many thanks for your submissions! We really appreciate you taking the time to be part of our newsletter. 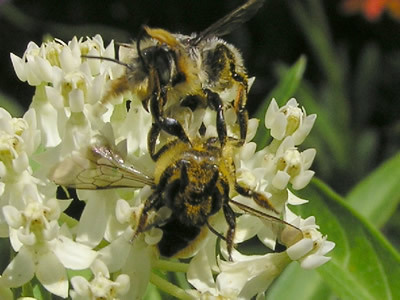 Each month we select a bug, wildflower and bird of the month. Here are this month's choices: Bug - Pacific Cuckoo Wasp; Wildflower - Wild Cucumber; Bird - Black-necked Stilt. This month we have discovered something rather unusual on the side of a tree. This is a rather large fungus called Chicken of the Woods, Laetiporus sulphureus. It grows on living and dead trees and is quite a sight to behold. 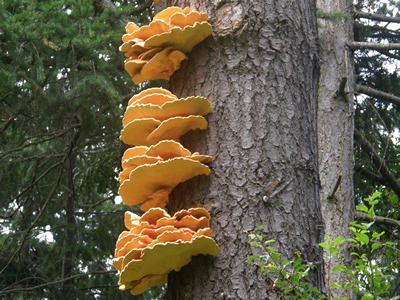 Two other common names for this fascinating organism are: Chicken Mushroom and Sulphur Shelf. To see more fascinating fungi, check out our At-A-Glance Guide to Fungi. Here's a little photo composition tip. With the ease of use of many of today's cameras, often all you need to really have to worry about is the composition of your picture as the focussing and lighting are taken care of automatically. 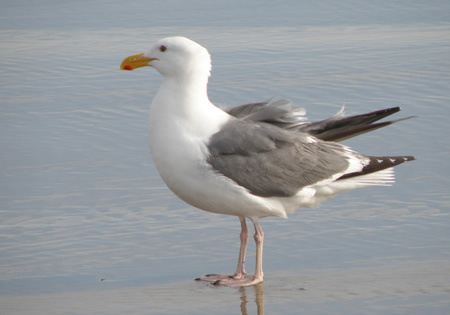 These two images are of the same bird but you probably like the lower one better due to the bird's poisition in the scene. If possible, try to give the subject a little bit of space in front of it as this creates a sense that it has a place to go and is not going to hit the side of the frame. This beautiful snippet was suggested to us by Tony D. of Toronto. 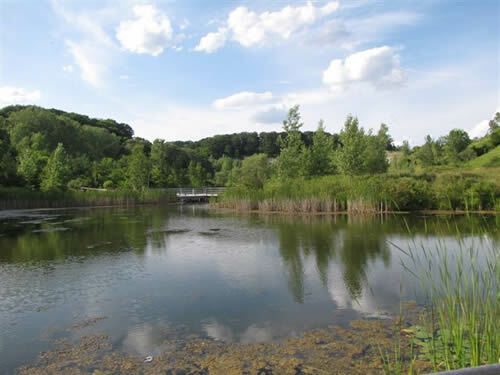 Tony explained this is Evergreen Brickworks - a reclaimed industrial site in central Toronto. The site is a wonderful celebration of nature and natural things. It's a great example of the importance of nature in the city and how old, run-down industrial zones can be completely renewed for everyone's benefit. 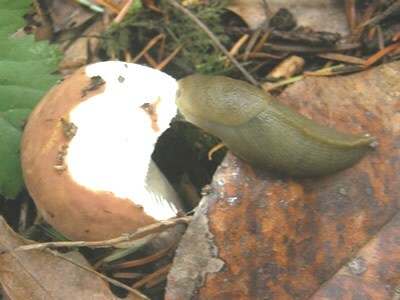 A photo of a slug eyeing a mushroom seems like an interesting scene that would inspire some funny captions. We came up with a couple. Number one: "Oh... these things are so good, they just can't be good for you!" Number two: "I don't think I could eat another bite. But how do I hide this tasty meal?" If you have any suggestions for additional funny captions, please, send us an e-mail. "No, I've done that one. Come and help check this side of the flower!" Thanks for the chuckle, Jan! In this section we examine the meanings behind scientific names. 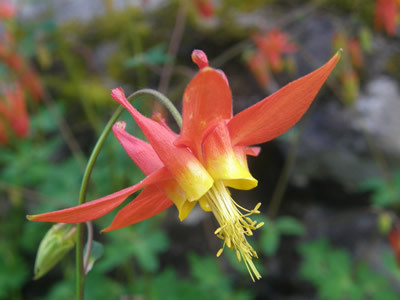 The Red Columbine has the scientific name Aquilegia Formosa. "Aquilegia" is from the Latin word "aquil" which means eagle and refers to the petals as they flare out like the wings of an eagle in flight. "Formosa" means beautiful and this flower truly is that. The common name "columbine" comes from another Latin word "columbina" which means "dove-like." It seems that birds were sure an inspiration when this plant was named. 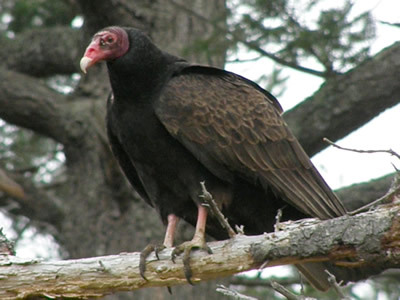 Carrying two dead squirrels, a vulture tries to check in at the airport for its flight. "Sorry sir," says the ticket agent. "You're only allowed one carrion." "Very funny! Can't you see I'm laughing?" 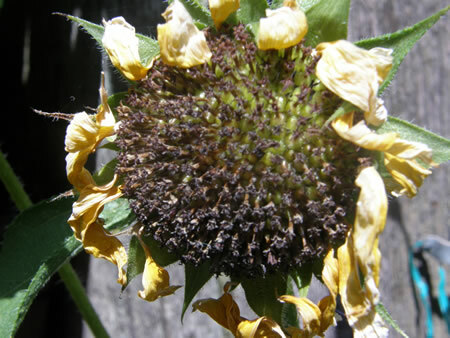 Don't de-head all the flowers in the garden. Leave a few throughout the winter for the birds to feed on. We already mentioned the Autumn Celebration in this newsletter but wanted to take a extra moment to offer our many thanks to everyone who submitted images for this activity. We really appreciate your help in making this a fun and successful project. You can see the final results by clicking here. 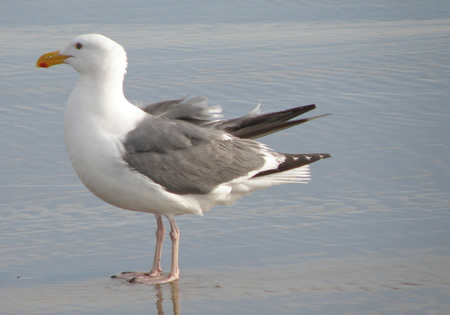 Did you know that even though many birds may appear similar in size, they may have different size eggs? The Killdeer (above) and the American Robin (below) are both similar size, but the Killdeer's eggs are twice the size of the robins. 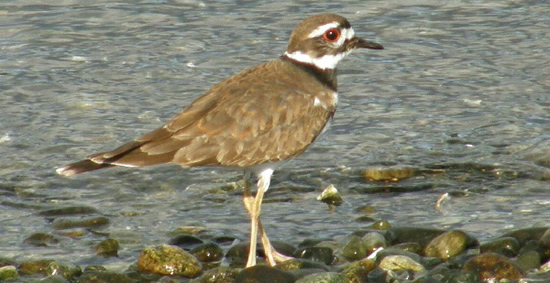 This is because there is more nourishment in the Killdeer's eggs which allows the embryo to grow for a longer period of time. 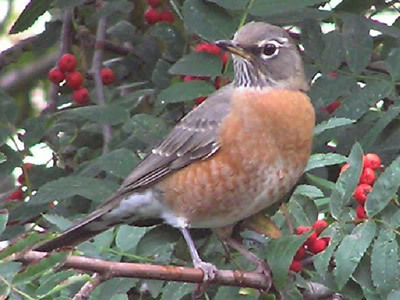 This extra time is required because as soon as they hatch the chicks leave the nest immediately whereas the American Robin feeds its young in the nest until they are ready to leave. What's the fastest insect? 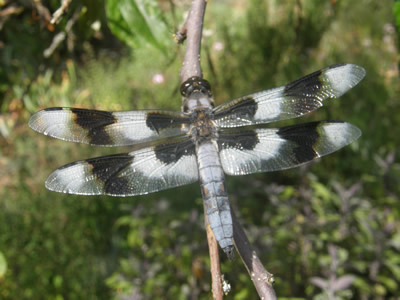 The Dragonfly. 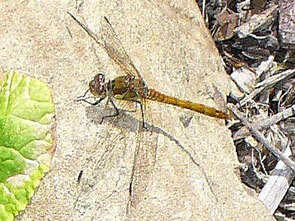 Some dragonflies can fly at 50-60 mph/90-100 km/h. It's the face of the larva of a Lappet moth, Phyllodesma americana. That was a tough one! How did you do? Watch for the next issue in your mailbox during the first week of December.